For the past ten years, what was to become of the land at 45 Beaver Place in the Beacon Hill neighborhood was up in the air. Former owner George LaPerle planned on developing the concrete hole in the ground into a two-family home, but met strong opposition from the public. The public was concerned about the size of the building and the visual impact it would have on the neighborhood, which resides on a corner of a road nearby the Arthur Fiedler Footbridge, which connects Beacon Hill to the Esplanade. 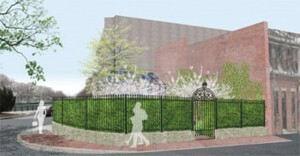 This rendered image shows the future garden at Beaver Place. Opponents of LaPerle’s plan can breathe a sigh of relief now, as the lot has been sold to Cynthia and John Reed. The Reeds plan on transforming the lot into a private garden for use by the community. Back in February, the Reeds bought the property, valued by the city at $847,900, for a whopping $3 million. Why did they pay such a high price? According to the Boston Courant, they paid this lofty price because they saw potential in the land. They saw the property as not only being able to be used by themselves, but by the community as a whole. Included in the garden will be a glass shed, large specimen tree, and a flowering tree, among other things. Tom Clemens, zoning and licensing committee chair of the Beacon Hill Civic Association, stated that, unlike LaPerle’s plan to build a two-family home, the garden proposal has received “a significant amount of support from neighbors for the proposals. The general feeling was that it was an attractive design.” Expect to see this new garden project completed in spring 2015, when the final plantings will take place. In the meantime, construction has already begun on the project. The garden is expected to open its gates to the public on rare occasions, so do not be surprised if it ends up being a part of next year’s Beacon Hill Hidden Gardens Tour!